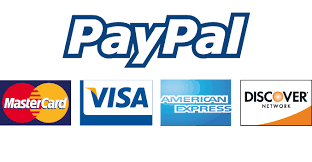 We accept payments through PayPal which handles all major credit cards. You do not need to have a PayPal account to pay by credit card. When you check out, click “Pay,”after that click on the “Don’t Have a Paypal Account?” link to go to the credit card processing page. Paypal offers leading security measures and buyer protection. Your online payment is handled securely by Paypal using the latest encryption methods. We don’t keep any records of your credit card information on file. We ship only after we have received the payment. We ship all over the world with FEDEX from Italy . Each delivery is safely tracked. Delivery time to your door is usually 7 business days worldwide from the time of your order and processed payment. Please leave a real street address and not a PO Box address, as we ship with Fedex and they do not deliver to PO Box addresses. Please also be sure to leave us a local phone number required for a better shipping experience. Thank you! Any custom duties or taxes are the responsibility of the buyer. We work with premium Fedex delivery service, therefore these events are very rare, but if occurs we will replace your order or offer a full refund immedeately. In case of Damage, we require it is filed immedeately upon same day of arrival. It is compulsory to take photos on the same day of arrival, of the package and the damaged painting, notify us and the shipping company (Fedex) via Email in order to file properly the case. If damage report is not filed as described above we will not consider it a damaged case. Please Contact Us right away, so we may help you. Packages that have arrived to destination but for some reasons are not picked up or recipient is absent or unavailable will NOT be refunded, so be sure to follow the tracking of your package through your local tracking postal service once we give you the International Tracking ID. Delivery attempts are clearly documented through online FedEX tracking system. After 3 delivery attempts we consider the package abbandoned. Please do note that every pc monitor displays colors differently, so the colors you see on the screen could slightly vary from the colors of the prints you receive. Our monitors are professionally calibrated on a weekly basis to ensure the best possible results. Normally our clients are very happy once received the original as they claim it looks even better in person! All paintings and prints are original and hand signed on the back by the artists Antonia and Fabio Duealberi. All work is protected under copyright including reproduction rights. Please note that sale of artwork does not transfer any sort of copyright. DUEALBERI Artists retain all copyright privileges and protections. Artwork may not be cut and pasted, published, copied, or reproduced in any way without written permission of the artists.